WTF?! In December, Samsung announced a partnership with Supreme (or should we say "Supreme"). Once it was found out that the company was working with Supreme Italia, a knockoff of the actual NYC-based company, Samsung was the subject of ridicule and embarrassment. In a frenzy to save face, Samsung tried to parlay the ill-fated partnership as intentional, but today caved to pressure to call it off. 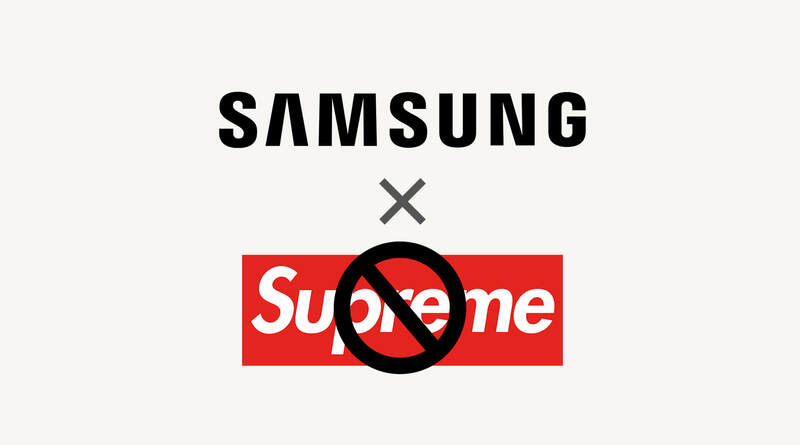 Samsung has mercifully ended its collaboration with a fake version of fashion brand Supreme, quietly issuing a statement via Chinese social media platform, Weibo. In a rather bizarre string of events, the company announced its collaboration with Supreme in December 2018 during an event in China. Samsung introduced two people posing as Supreme CEOs, who walked on stage to announce the opening of a flagship store in Beijing. As it turns out, Samsung had been duped into working with "Supreme Italia," an Italian knockoff brand with no relation to the NYC-based Supreme. Supreme Italia was operating legally due to the failure of the real Supreme to defend its trademark earlier in the year. This forced NYC Supreme to issue a statement saying they were not working with Samsung, and were not opening a store in Beijing. Samsung then tried to save face by acting as though they were intending on working with the Italian knockoff all along. Got all that? Samsung had originally pursued a partnership with the counterfeit Supreme Italia due to their license to sell its wares in China - a market in which Samsung is rapidly expanding. With the deal dead, Supreme fanatics everywhere will never know what products this collaboration was meant to bring to market.